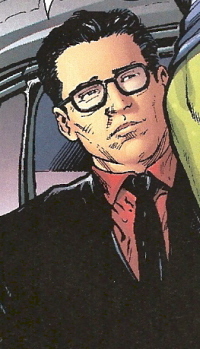 Real Name: Terrence Haller, Jr.
Powers/Abilities: Containing no superhuman abilities, Terrence Haller is a talented businessman and skilled entrepreneur. History: (Inhumans V#11 (fb)) - Son of Terrence and Margaret Haller, Terrence Jr. had one younger brother, William. 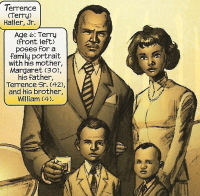 When Terrence Jr. was 7, his father inherited Haller Industries and the Haller estate from Terrence Jr.'s deceased grandfather. Terrence Jr., called Terry, won a Pinewood Derby when he was 8, and when he was 10, his brother William died from an aortic aneurysm. Terry soon moved to Ellington Preparatory School when he was 11, played Tom Sawyer in the school play when he was 12, and won the Ellington Creative Writing Prize when he was 15. When Terry was 16, Terry's dad passed away from liver failure, and his mom from an overdose of sleeping pills, determined by the doctor's to be accidental. At age 20, he gradated from Yale with honors and became the head of Haller Industries. He brought his company to new heights, entering the Fortune 500 and being named CEO of the year several times, and, at age 29, married his secretary, Sheila Bergstrom. In a year, they had a son, Terrence III, but Sheila died four years later from a deemed 'accidental' overdose of antidepressants. Haller Industries' business went way down. He invested millions in Progeria research, and his son soon took ill, needing gene therapy to survive. Terrence searched far and wide for a cure for his son, including psychics, shamans, and stem cell research. Eventually, he heard about Inhumans visiting from the moon. (Inhumans V#8) - Haller sent Richard Anderson to Madison, Wisconsin to offer the Inhumans a large sum of money for Haller to study their genetic potential. They refused, though, even when told human lives were at stake. Anderson delivered the news to Haller, who authorized Anderson to take whatever action necessary. (Inhumans V#9) - When the Inhumans left their home, Haller sent in a team of mercenaries to gather whatever genetic material they could find. 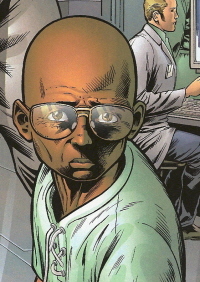 While waiting at his son's bedside, Haller received the news that Dowlati and Myers, the scientists he'd hired to look over the genetic material, could likely use the Inhuman stock to cure his son. 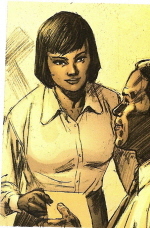 Haller contacted Mister Chase, who he hired to bring in one of the Inhumans. (Inhumans V#10) - Chase apprehended the Inhuman Nahrees, and the scientists began examining her. Haller introduced himself to the shackled Nahrees and introduced his son. (Inhumans V#11) - His son on his deathbed with only a projected week to live, Terrence kept Mister Chase on salary for a time. 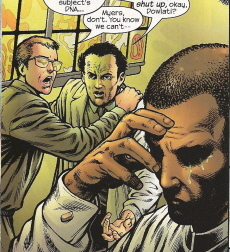 Haller ordered Chase to leave Nahrees alone, then found out from Myers and Dowlati that the healing plans weren't working, and wouldn't unless they melted her to a genetic soup. Haller left to think about whether he could condone her murder or not. At his son's bedside, he cried, willing to do anything to keep his son alive. (Inhumans V#12) - Haller was shocked when the Inhuman San came in and approached his son. San, with Haller and his son, entered, interrupting a battle between Chase and the Inhumans, and San stated that he agreed to give his life so that Haller's son could live. Then Jolen, revived, shocked them all by murdering Chase with roots through the abdomen. Tonaja then freed Nahrees, who was tempted to kill Haller, but Tonaja stopped her. The F.B.I., including Agent Scott Forbes, then arrived and arrested Haller. The Inhumans were free to leave. Haller got Forbes to agree to give him five minutes at his son's bedside, and Haller took the chance to kill himself. Comments: Created by Sean McKeever, Robert Teranishi, and Nelson. (Inhumans V#11 (fb)) - Born to Terrence Haller Jr. and Sheila Bergstrom Haller, Terrence III was four when his mom passed away. At age six, Terrence III took ill and his dad started looking for cures. When Terrence III was ten, his dad had exhausted all resources and looked to get help from the Inhumans. (Inhumans V#9) - Haller sat by his son's bedside. (Inhumans V#10) - Haller took his son to meet the Inhuman captive, Nahrees. (Inhumans V#11) - Terrence III was comforted by his dad, who hired the dangerous Mr. Chase to watch over them. (Inhumans V#12) - Terrence III was sitting with his dad when the Inhuman San came in. Haller, under arrest, killed himself at his son's bedside. (Inhumans V#8) - Representing Terrence Haller, Jr, Richard Anderson approached Tonaja of the Inhumans in Madison, Wisconsin, offering large sums of money to procure some of their genetic makeup to study. Tonaja cut him off, not even willing to concede when he told her human lives were at stake. (Inhumans V#9) - Employed at high rates by Terrence Haller, Jr. to find genetic material to save his son, scientists Dowlati and Myers examined genetic material form the Inhumans, they realized the potential was there for curing Terrence Haller III. They reported the news to Haller. (Inhumans V#10) - Mister Chase captured Nahrees, the electrical Inhuman, and the scientists began examining her. Dowlati apologized to Nahrees, stating he would help her if he could, but he was interrupted by Haller. (Inhumans V#11) - Dowlati and Myers discovered that they could not access Nahrees' genetics unless they killed her and made a genetic stew. Myers told an angry Haller about this, despite Dowlati's protestations. As Myers' prepared to kill Nahrees, Dowlati had second thoughts, but Myers wouldn't hear it, justifying the murder. Dowlati, distressed, rushed outside and was caught up in the roots of Jolen, another Inhuman. 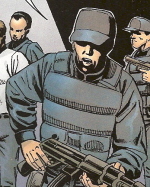 The Inhumans rushed inside and found Nahrees, though Chase shot Jolen in the head. (Inhumans V#12) - Chase shot Alaris, who was resistant to the bullet. Alaris picked Chase up, and Chase shot him in the throat, then the head, knocking Alaris out. Tonaja leaped on him, disarming him, while the scientist Dowlati stopped Myers from hurting Nahrees. San, with Haller and his son, entered and San stated that he agreed to give his life so that Haller's son could live. Then Jolen, revived, shocked them all by murdering Chase with roots through the abdomen. Tonaja then freed Nahrees, who was tempted to kill Haller, but Tonaja stopped her. The F.B.I., including Agent Scott Forbes, then arrived and arrested Haller. The Inhumans were free to leave. Dowlati tried apologizing to Nahrees, but she kicked him aside. (Inhumans V#11 (fb)) - Terrence and Margaret Haller raised their two sons, Terrence (Terry) Jr. and William, and moved them in to Haller Estates when Terrence's father died. Terrence inherited the lucrative Haller Industries. William passed away from an aortic aneurysm when he was 8. Terry went to a preparatory school. Years later, Terrence passed away from liver failure and Margaret from an 'accidental' overdose of sleeping pills. (Inhumans V#11 (fb)) - Secretary for Terrence Haller, Jr., at Haller Industries, Sheila became Terrence's wife and bore him a son, Terrence III. Four years later, she died from 'accidentally' overdosed on anti-depressants. (Inhumans V#12) - Special Agent Forbes of the F.B.I. intervened in a battle between the Inhumans and David Haller, whose hitman Chase was murdered. Forbes arrested Haller and then let the Inhumans go free.